Are you looking for a reliable and sturdy baby gate? Then you may want to check out the Regalo Home Accents Extra Tall Walk Thru Gate. The Regalo Home Accents Extra Tall Walk Thru Gate expands to fit openings between 29" and 44". It stands 38" tall. Along with the gate are 4" and 6" extensions. This product can be pressure mounted or hardware mounted. The door locks automatically when pushed closed, and the walk through design makes it easy to pass through the door. This product has an all metal frame, and is very sturdy. As of this writing there were 2,262 customer comments and 243 answered questions for the Regalo Home Accents Extra Tall Walk Thru Gate. I've read through the customer feedback, and then condensed the results into this review. I hope that this helps you when shopping for a baby gate. There are both 4 inch and 6 inch extensions included with the purchase of this gate. That means that this gate can expand to fit doorway openings that range from 29 inches to 44 inches. "The only thing I would warn people about is the gate is a little narrow, someone that's a little wide might have a hard time getting through. I honestly didn't notice it until we had company that joked about almost not fitting through our gate. (awkward) Other than that we love it." "We have a toddler that could break out of a super max. He has killed (I do mean killed) several gates. Our last gate was defeated so quickly we kind of cried a little (on the inside). We even had to zip tie it closed to keep him of the stairs of death. But not this gate, this gate has left our little Alcatraz buster at a complete standstill." "It is easy to install and attaches firmly without having to be mounted to the wall with hardware. It does include hardware if you want to attach it." "I felt it was a great value for the price we paid, and would recommend it to anyone wanting to keep small children or pets out of a certain room." "I love it! True one hand operation and very easy to open. The tension on the latch is not too much, but is just enough that if my child does figure out how to use it, he would be able to slide it and push the button." 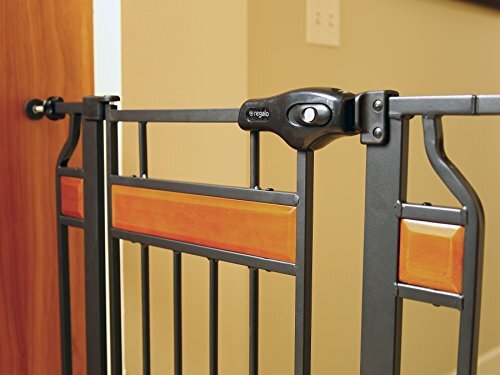 The Regalo Home Accents Extra Tall Walk Thru Gate is an inexpensive gate that can be operated with just one hand. It can be both pressure mounted and also hardware mounted. It is sturdy and durable and offered at a great price. One disadvantage for wider people is that the gate is very narrow to get through. Other than that, this a great value for what you get. I hope that my review of the Regalo Home Accents Extra Tall Walk Thru Gate can help you decide if this is the baby gate for you!